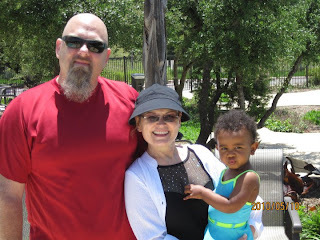 Billy's mom, Winky, graciously and excitedly came down to San Antonio to help Billy with Gracie while Libby and I were away. I am so thankful to her for coming all that way to bless us. It gave me a peace of mind to know that she was keeping Gracie entertained and giving Billy some breaks along the way. And many thanks to BC (my f.i.l.) too for allowing Winky to come down. They had a revival going on for which BC was preaching and Winky is usually the soloist for those revivals. So, BC was very generous in allowing us to have her here that week! And on top of all of that - my house was clean when I returned - OH YEAH! Thank you, Winky!!!!!!!!! Here are a few of the pics Winky took while I was off in Haiti.. Most of the following pictures were taken from the inside of a Land Cruiser during our trip in Haiti. And most of the pictures of the destruction are from the city of Port au Prince on our way to the airport. The first three pictures are from the highest peak in Haiti where there is a beautiful lookout point and paintings for sale. It didn't take long to have the girls up and ready in their matching clothes for the day. And by 6AM we were being called to breakfast where I had my last picture taken with Keemberlie before departing. After breakfast it was time to wrap up our packing. One of the pictures/memories that brings me to tears is the one below where Keemberlie is packing her backpack. She would no longer be able to keep it safe under our bunk. It was time for her to be on her own again. I know she is surrounded by loving faculty and over a hundred friends in her same position. I know that she probably doesn't process thoughts the way I imagine she does, but watching her stuff her new possessions in her bag I couldn't help but think about how she knew our time together was over for the time being. And with that thought I wondered - what she was thinking, did any of this make sense to her, did she wonder if she would ever see us again... and the questions/wonder go on and on in my mind. I will say, though, that it seemed Keemberlie had gone through all the sad emotions the day before. On this morning, our final morning there, she had kind of checked out from the emotion and was in and out of the room with us, often off playing with her friends. Maybe she doesn't like good-byes. Maybe she is too young to really understand. But at least she wasn't crying because if she had been I might still be in Haiti! You can see here (above) the baby wipes that Libby and Keemberlie loved to wipe on their skin just to cool down. And here (left) you can see that while Keemberlie is about 1.5 inches shorter than Libby, her arms are longer than Libby's and her feet are bigger. When I told Libby that Keemberlie's feet are bigger than hers she was shocked that I would say such a thing. The only thing that soothed her competitive spirit was knowing that her (Libby's) head is bigger than Keemberlie's. Libby loves nicknames so I suggested we start calling Libby "Big Head" and she laughed and quite quickly came back with, "And we can call Keemie 'Bead-Head'" HAHA! Below is a picture of Libby and me with Pastor and Madame. I truly enjoyed watching them rejoice in and be passionate for the children of HCRM. With backpacks on and headed in two different directions, Libby and Keemberlie stopped for a photo. The HCRM kids and visiting families gathered together for a group photo. One of my favorite pictures of our last morning at HCRM is this one of Libby and Keemberlie holding hands in their colorful shirts. And this one (below), of course, with Moise. Libby actually didn't want Keemberlie in this photo as she wanted to take a picture with just Moise. But Keemberlie wasn't having any of that! And the rest of the kids waved good-bye from the balcony as we drove away. How do you tell your child good-bye???? Oh the tears I have cried!!!!! But Daddy Billy is headed to Haiti in June and, in the meantime, I am before the throne of God begging for an expedited adoption process! Jesus said to ask anything in His name and He will do it, so in the name of Jesus I am asking! By day three we had a rhythm going. We knew when to expect Keemberlie to show up in our room and she knew I had an outfit waiting for her that matched Libby's. The only way to get Libby in a dress is to make sure it has NO flowers and is mostly blue and, luckily, Keemberlie loves the color red, so the dresses below were the perfect match. Shortly after these photos Keemberlie was called down for bath time. We followed her downstairs to the area they use for cleaning laundry and watched Keemberlie and her friends brush their teeth and take a minimal bath. Once cleaned up I put Keemberlie's braids in pigtails and fixed Libby's hair for this precious photo. I LOVE this picture of Keemberlie and Libby looks so cute too! The next photo shows the sores on Keemberlie's wrists and ankles. She has scabies and I think she's scratched them so much they are infected. The poor thing scratches all day long, from the second she wakes until she is asleep if she's still enough to think about it. I can't wait to get her home and get her well fed and completely healthy. As the morning continued I pulled out some glow-in-the-dark beads and tiny rubber bands (or as Keemberlie would say "elastic"). A couple of the older girls showed me how to add 2 beads to the end of each tiny braid of Keemberlie's hair. I was slow at first, but after 2 hours of beading I got the hang of it and was moving along at break-neck speed. The end result was a head full of beads which Keemberlie would shake back and forth to hear them click together. She was so excited about her beaded hair. The beading really did take up most of the morning. During that time Libby played with Moise in the same room. I could hear her bossing him around as if he could understand. He followed her around and did his best to play along with her silliness. To the right is a picture later in the day of Libby with Moise. They were always smiling together (so adorable!). The mountains of Haiti are beautiful. I had no idea how beautiful Haiti. As we flew into Haiti I was so impressed with the mountains. While HCRM is not really in the countryside, it is in a hilly area overlooking some pretty views. This is the view from one of the balconies. Other faces of HCRM.....Libby made some special friends and some of them will one day be adopted by other San Antonio families. A whole new community and way of life for some of these precious kids is on its way! I've mentioned it before, but the team of families we traveled with was/is so amazing. I am so excited that these families live near us and we can all walk this journey together. Here are some pictures of a few of our teammates hanging out with HCRM kids. Mark Allen gets kudos for painting many of the girls' fingernails! You go, Mark! More faces of HCRM: In the photo to the right (below) Keemberlie is showing her friends her book about her family. The kids seemed to enjoy gathering around to see the pictures of the life that awaits Keemberlie. At the same time, I just longed to offer them hope that the same awaits each of them. Jesus, set these lonely faces in families according to your perfect will and timing. However, a little while later a huge crowd of kids gathered on the big balcony with a long jump rope and they started asking if Libby wanted to try again. Again she went out there and only got one jump in. She walked back to me, but this time only for a few seconds. She walked right back out there to try again. This mommy was starting to get proud of her courage to learn this in front of so many watching eyes. She jumped three in a row this time and the crowd cheered so loud, jumping up and down with excitement. Libby came running to me with a look of "I like this, but I'm so embarrassed". She tucked her head into my body to let the attention subside. Some other kids wanted to jump, but an older boy stepped in and told everyone to wait until Libby was ready to try again. Can you imagine knowing that 100 of your peers were waiting for you to come try again after so many less-than-successful attempts? But, next thing I knew, Libby stepped right up to that rope and tried again... this time she jumped 8, the next time 15, the next time 20 and then 30.... Libby turned into a Chinese Jump Roping Star in about 15 minutes. The entire orphanage was out to watch and enjoyed every minute of it. Proud of herself, Libby confidently walked with Moise when the crowd dispersed. More play time ensued after Libby gulped down an entire bottle of Gatorade. Around this time there was a translator present. I was already starting to think about the fact that we would be leaving the next day. I didn't know if Keemberlie knew we would be leaving so soon (since our trip had been cut short by a day due to flight changes) and I definitely wanted her to know that she would be missed and we would be working very hard to get her home to us. So with the help of the translator I was able to share this with her. At the end I asked the translator to ask her if there was anything she wanted me to know and she told him to tell me that she loves me, which = one happy momma! And then it was nap time. We went back to our bunk room with Keemberlie. I can't remember what happened when we first got to the room, but I think I gave her something and Keemberlie busted out in perfect English with "Mom, thank you sooooo much!" And I busted into happy tears. And with that I decided to see if Keemberlie would take a nap with us. All three of us packed into the bottom twin-size bunk and fell asleep. The girls both slept 2 hours. I could just sense a peace come over Keemberlie. She was really settling in with us. To back up a little, around the time we spoke through a translator, Libby and I were looking at the mountains and having a little chat. She quietly and seriously asked, "Mom, why did God make the earthquake?" Such a heavy question. She was starting to process the consequences of the natural disaster and could not understand why such a terrible thing would happen. I explained to her that when Adam and Eve disobeyed God and ate from the Tree of the Knowledge of Good and Evil, they not only brought sin on themselves, but on the entire world. And now, even the rocks and the earth cry out for God's presence and groan for Jesus' return. The earth itself is in turmoil because of our sin. But I reminded Libby that God is always taking even the bad things and turning them into good for those who love him - which is how Keemberlie is coming into our lives. Libby seemed satisfied with the answer and we moved on to other things, but in both our hearts was an obvious grieving over the heartache that sin and destruction brings to people and growing compassion for the people of Haiti. After our naps I heard some of the ladies on our team talking about the "plywood room" for the older girls. I had not seen this room as it is on the back side of the building. I decided to go on a walk with the girls to see it. It had been raining so I kept reminding the girls to be careful as they walked. There were about 5 wooden steps that lead into the plywood room. I held the girls hands as we entered. This is one picture of the inside of that room. As we left that room I decided to hold both of the girls because I could tell the wooden stairs were very slippery due to the rain. I held Libby on my right side and Keemberlie on my left as I reminded myself to move slow and be very careful. I set my foot down in the center of the first step and it was so slippery my foot came right out from under me and I went airborne coming down with the weight of both girls onto my upper back on that top step and then sliding down the rest of the way on my lower back. When I fell on my back Keemberlie was flung out of my arms onto the rocky ground below. Libby was holding onto me so hard that she was still attached and somehow her legs did not get pinned under me and she was without a single scratch. But as I laid there at the bottom of the stairs I heard Keemberlie screaming with her tiny little voice so I got up really quick to check on her. I was so worried she had a broken bone or something, but thanks be to Jesus, she just scratched her elbow up a bit. I was pretty shaken and started calling out for the older girls nearby to go get some help. I started feeling my back tense up and wasn't sure if I was okay or not. Mark Allen arrived quickly and walked us all back to the bunk room. Keemberlie was still crying and needed to be loved on, but I was so shaken (literally) that I couldn't hold her at that point. Another lady on our team, Julie, held her and attended to her wound while the other ladies checked my back and laid me down on some ice. Keemberlie was not looking at me or talking and I was so worried that she was mad at me or hurt worse than we knew. Libby was happy to play "Dr. Hospital" as she used the end of her jump rope to listen to my heart. I just laid there with tears streaming down as I was in pain and so sad the Keemberlie was hurt. And that darn language barrier was on my nerves at this point as I so badly wanted to tell her I was sorry and everything would be okay. An hour or so later we walked to the smaller balcony to hang out and work on a craft. I was still having a few waves of tears off and on. Something about that fall stirred up several emotions. The reality that we were leaving the next day was very present in my mind and Keemberlie still seemed withdrawn. Finally, I was (thanks to Advil!) starting to feel strong enough to hold Keemberlie in my lap and love on her. As I talked to her (not knowing how much she could understand) she started smiling and warming up to me again. It wasn't until we returned home that I realized (with the wisdom of my friend, Terry) that Keemberlie might have been concerned that I would think the fall was her fault or that I was mad at her - which, of course, was NEVER the case. But that might have been what was going on in her mind. Not only that, just as the fall stirred up some sad emotions in me, Keemberlie might have also, through that painful moment, been reminded that we would be leaving her the next day. Whatever the reason, it was heartbreaking to watch Keemberlie withdraw, but equally wonderful when she came around and returned to her sweet, comfortable, loving self. This picture was taken right after I held her for a while. Realizing everything was okay, she was ready to participate in a craft. I kept this specific craft to put in a special box for Keemberlie. The picture to the right (below) is of sweet Stanley who witnessed my fall and was so concerned for me. He kept checking in on me and when he saw me crying he was so very concerned. Such a sweet kid. He is matched to a nurse with Angel Staffing. Crystal, you are a blessed woman. Stanley is a treasure. And then it was getting late and it was time to start re-packing. I set the girls in the bunk room with the Chipmunks movie. Keemberlie loved the music. The tiny voices of the Chipmunks made her smile. I hated packing my bags. The thought of leaving Keemberlie behind made me want to sob. I kept swallowing large lumps in my throat, holding back the waterfall of tears I wanted to shed for her. Our time together had gone by too quickly. I felt the anger rising at how difficult the international adoption process can be. Why does it have to be so difficult, so long? We want her, she wants us. We've proven ourselves over and over having now completed 3 dossiers in the last 6 years of our lives. We have the desire, the money, the papers and still we must wait. I know God's timing is perfect. I'm not questioning his timing. I just think the process of international adoption is grueling and takes far too long. As I packed our bags a fabulous team of doctors and nurses from a particular foundation showed up to look over and attend to any medical needs of the kids there. The head physician was such a light. Without a word, I knew he was a believer. Praise the Lord for surprise visits from God's people, ready to serve and help and heal. The night was upon us and on this last night I knew I would not be able to look Keemberlie in the eye and send her away from our room for the night. But currently she was off playing with a friend as I prepared Libby for bed so I wondered and hoped that she would just head to her "bed" for the night on her own to avoid having to take her myself. No sign of Keemberlie came so I climbed into bed with Libby. I had my earplugs in, my retainers in (looking really good, haha!) and my eyes closed when I felt Keemberlie come to the bed and lean in towards me. I opened my eyes, took out my earplugs and spoke to her with the lisp that only retainers can cause. I asked her what she needed. Of course, she didn't understand me and just sat there looking at me with no real expression. Then I asked if she was ready to go to sleep with her friends. She shook her head no. I pointed to the bunk above me and asked if she wanted to sleep up there (it was empty since Libby and I were sharing a bed). She smiled and shook her head yes. I sat up and hugged her and then I said, "Before you go to bed I want to tell you a story." She looked at me as if she understood so I continued. She was leaning in on her elbow and looking out into the room while I held my arm around her neck and caressed her hair and face. I began telling her the story. "Keemberlie, when I first found out your name I decided to find out what it meant in our language. Did you know your name means, 'From a Royal Forrest?'" At this point it seemed like she was really listening and maybe even understanding so I kept going. "Do you know what that means? That means that you are straight from Jezi (Jesus). That means you are a daughter of the great King who rules the Royal Forrest. That means you belong to Jezi more than you belong to Haiti. And that means that Jezi will make a way for you to come home to us at just the right time because He is in charge, not Haiti." At this point I was certain that she understood because she smiled and right then the photographer who was on our trip with a reporter from the Dallas Morning News (following the story of another family) said quietly, "I think she understands." I think she did. I think God gave her understanding in that one, sweet, unforgettable moment. Field in Haiti now adequately watered for the day! I continued talking to Keemberlie, reassuring her of our love and that we would miss her so much. I hugged her and then got her up into her bunk for the night. Having her close all night was such a comfort to me. During the night another HCRM girl decided to fall asleep on her mommy's bunk, so we put Keemberlie in the bunk with that girl so the mom could have her own bunk. Now, Keemberlie was right in my line of sight as I laid there resting. There would not be another night like that for a long time.